Ok, I'm just trying anything now with crochet. I thought that I'd like a little purse for my camera and/or phone. So, I did several rows of half double crochets. Then I folded up two thirds and secured the sides to make the bag part. Turned it inside out to place the seam inside the bag. I then Added a double crochet loop to the bottom center. I also added a double crochet tongue on the flap. Then I tied that in a knot that would slip in the loop on the front of the bag. For the wrist strap, I croched a quilt strap of double crochet and then attached that in an arch on the back of the bag. Here's my free form electronics bag. To make it match my scarf and hat, I added a row of shell stitches on the edge of the flap. It won't be long until I'm back to my quilting. We'll be home in about two weeks. It will give my cramping hands a rest from crocheting. Shortly, I'll show you the progress on my first crochet afghan. That is so cute! I am going to make me a few, as we all have phones and cameras to carry. It could also loop on a belt couldn't it? It was really easy. 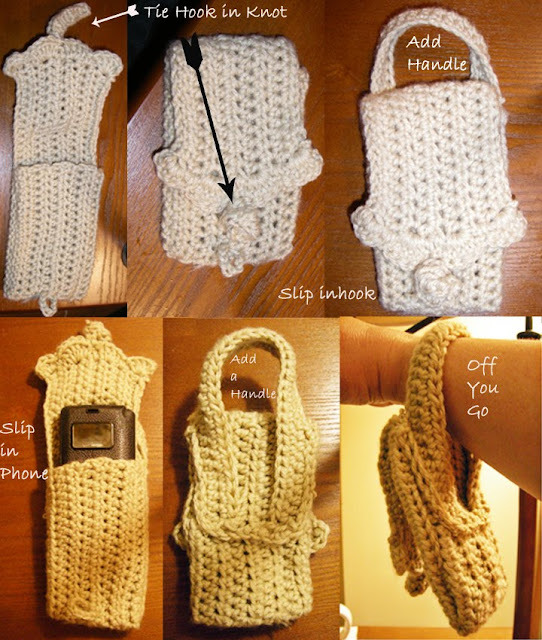 Just crochet enough rows to cover the width of your phone or device. If you want it on the belt, you'll probably need to create a one-sided loop on back instead of permanently attached. That way you can wrap around your belt and then maybe snap or button the other end to your bag. Thanks for visiting.